If in Detroit you have to plan a stay at the incredible new The Siren Hotel in the revamped Wurlitzer building. The Wurlitzer building was built in 1926 + the company operated out of the location until the 1970’s. Since 1982 the building sat empty falling into disrepair until the amazing folks at AshNYC saw it for the diamond in the rough that it is. 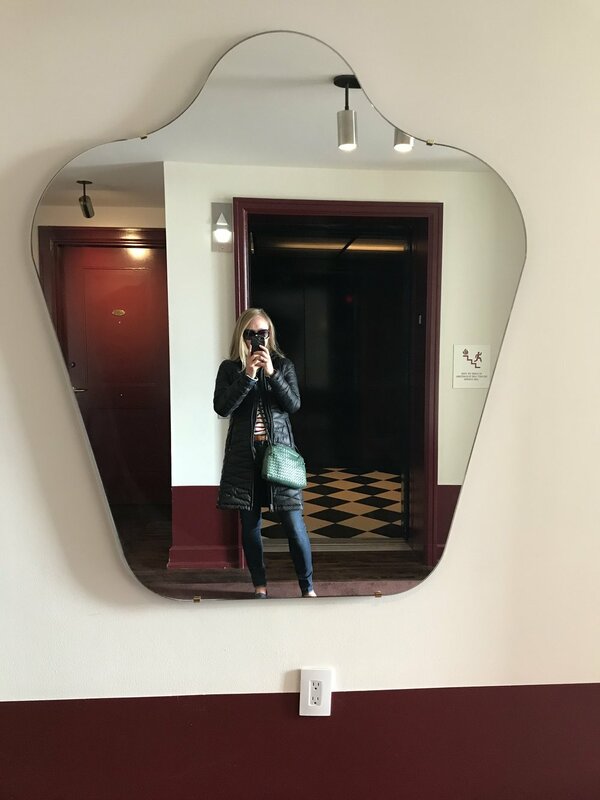 After extensive renovations they opened the hotel in 2018, along with a funky lounge, the Candy Bar, on the ground level + an amazing coffee shop in the lobby. Our stay was wonderful + the thing that set The Siren apart were the amazing details that made the hotel a one of a kind experience. I went to Detroit to celebrate a family birthday + got the exciting perk of getting to visit this gem. At first coming into the lobby (in the cold of a Detroit November) we were greeted with a warm + well put together lobby, the spaces have a design that seamlessly blends new touches with the historic building. The overall feel was darker + had more color than what I am usually drawn to, but the space had everything I love: wood, natural stone, + greenery. In the center was the reception desk, + in the two front corners were seating areas that allowed the hotel guest to mingle before they head out to see the city. If I wasn’t already in love with everything this hotel had to offer, I started to make my way up to the room, but first we had to walk down a long hallway that was painted completely black, the wainscot was high gloss giving the hallway a larger feel + providing reflections of the black + white floor, while the upper walls were painting matte in the same color. The square wall sconces led the way to the elevator. After we made our way up to our room I opened the door + was instantly excited by what I saw. 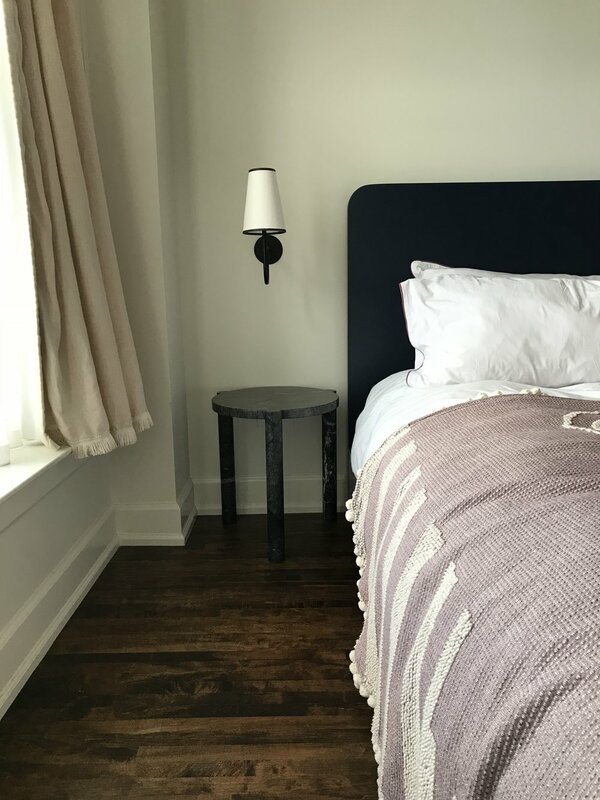 Custom bedspreads, velvet chairs, marble tables, + a simple wood bed frame, what more could you ask for in furniture. The team at AshNYC really knows how to design a space that is welcoming + has its own style. 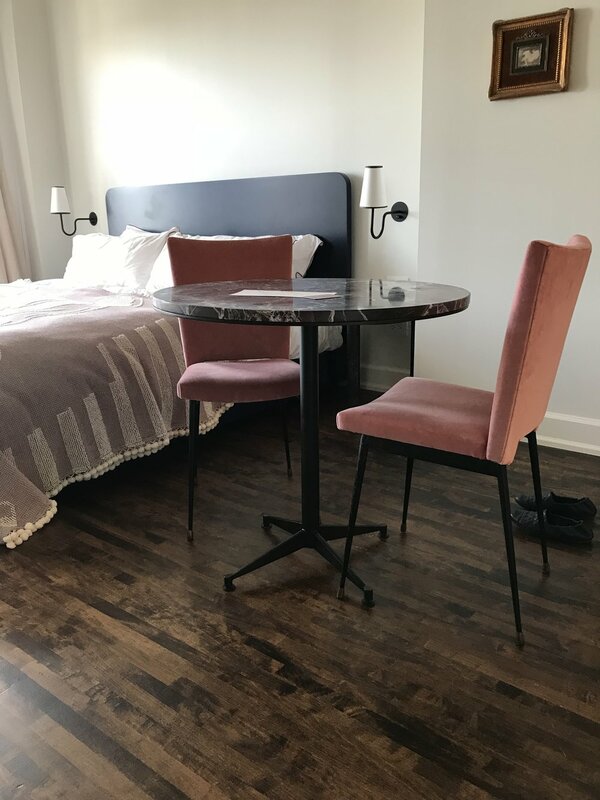 The extras in the space, like the unique trashcan or the snack bowl filled with Michigan staples like Vernors, are not to be overlooked, as they seem to give the room the feel of high design. 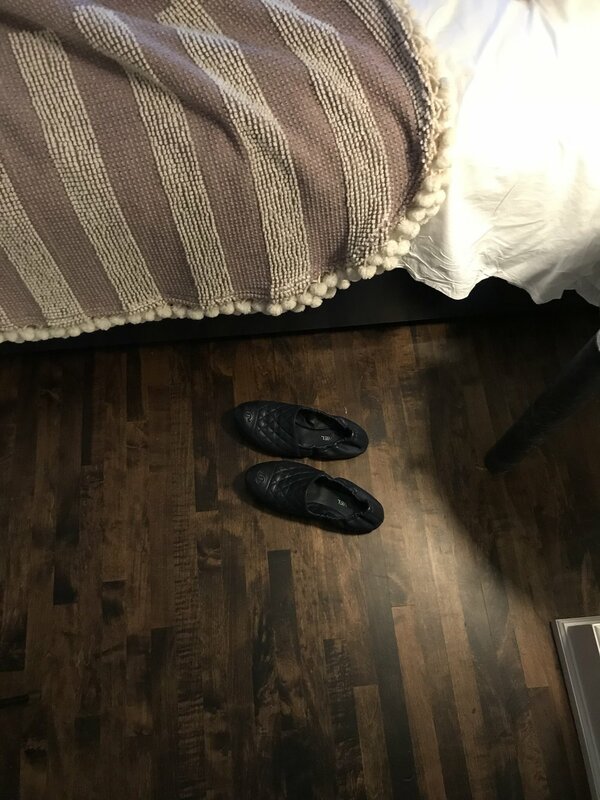 I do have to say the original wood floor was a material that I was very glad to see used. 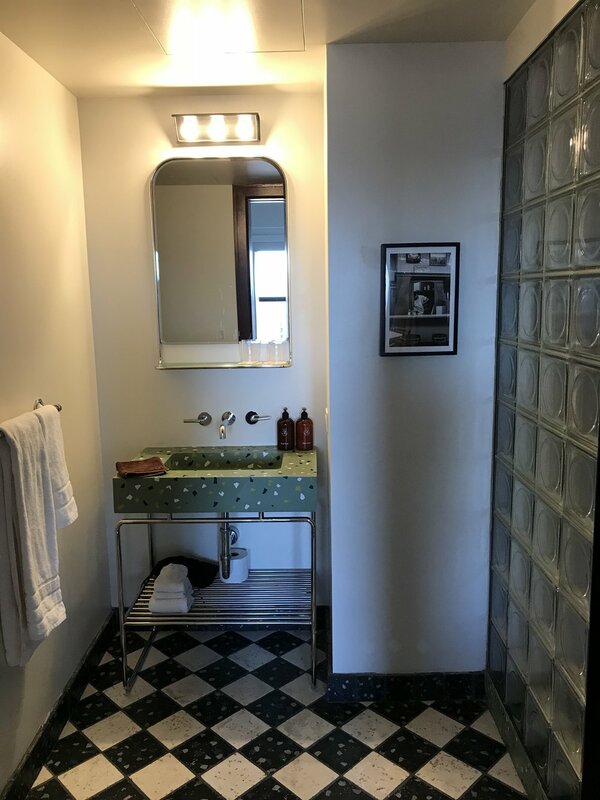 The bathroom was just the right size, the custom green terrazzo sink basins + shower tile made for the hotel, gave it a luxury feel while playing with the historical characteristics of the original building. It was a nice change to have color in a hotel bathroom contrasting with the black + white checkered floors. 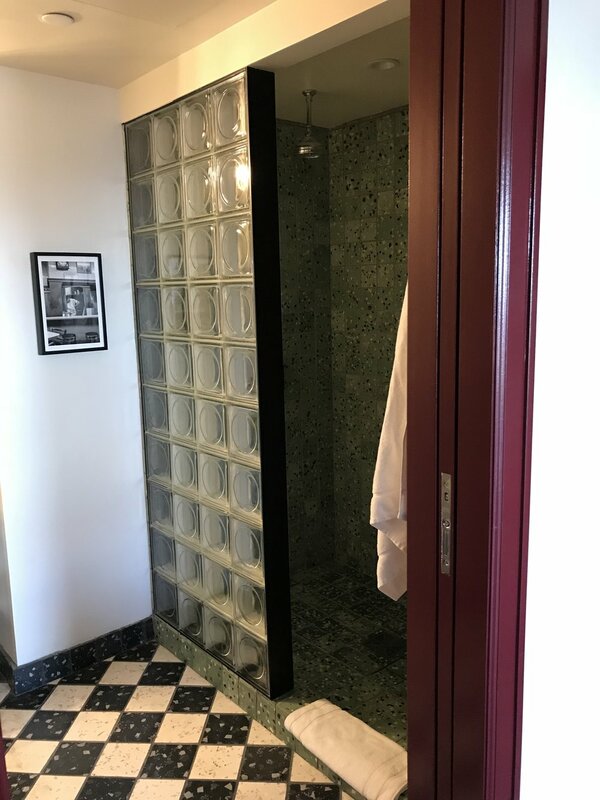 I love open showers + am normally not a fan of glass block but they used it in such an interesting way that even I was digging it. I left wishing my trip could have been a little longer, I will definitely be back very soon. I also can’t wait to stay at the other Hotels by AshNYC… Detroit will be forever changed as the Siren starts to call people back to the city. Older PostFavorite MOMENTS of 2018! !